Pinot Noir is a versatile but finicky grape variety. It’s versatile in that it can be an easy and amazing food pairing wine, matching well with pork, pasta, chicken or even seafood like salmon. It’s finicky in that it only grows in certain growing conditions and is a bit difficult to grow. Conditions in the vineyard must be almost perfect. Irony Pinot Noir is one of my favorite Pinots because it’s a well-made wine, coming from an ideal growing area for Pinot Noir; Monterey in California’s Central Coast. 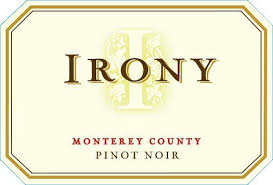 Irony has balanced red fruit with spicy notes and some acidity.